Platinum Club announcement restricted to current PC members? Some people were getting that, but I think it should be working now. If you still get the same message, could you try logging out and back in again and see if that helps? Nope still getting the same thing even after logging out & back in again. I did catch the pc anniversary banner and was able to look at that page but even so I still remain on the fence at the moment. I was a pc member for several years so I do know the value of it but all the issues people have had really has me nervous about joining back up right now. I remember getting several products as a bonus for signing up in the past and was kind of hoping they had continued that. Right now the top thing for me is the gen3 iconic shapes bundle for genesis and doing the math it looks like it will probably be a wash between just buying it outright vs. joining pc and buying it. Guess I'm going to have to think on that a bit more. you're not the only one!! between this and the whole lack of subsciption issue, and the kind of depressing announcement not a big loss though. If you're the lucky winners, cool. If not, well.... too bad. I am getting it as well. It’s been 10 amazing years and we want to celebrate with you! We’ve lined up loads of specials through the month of October, so keep checking back to the Members Only forum for details. There’s freebies, coupons, extravaganza bundles, super savings, and of course heaps of fantastic new releases from all your favorite Platinum Club artists. If you are not a Platinum Club Member Join Now to take advantage of savings ALL MONTH LONG! Platinum Club Members follow the discussion in the Members Only Forum HERE! Can someone please clarify a few things with me regarding the PC Membership Anniversary Promotion? What is the total discount on Daz Originals? Can someone please verify if they are actually giving BOTH? Are they offering 3 coupons which cannot be combined and each one has to be applied to an individual order totaling $20 coupons? Wasn't the "Members Choice" items reduced to $1.99 for PC members and not just 50% off? Also can someone please publish the current list as with me currently NOT being a PC member, the "Vote Now" link doesnt work for me. Please advise and thanks in advance! The Member's Choice sale winners were $1.88 in 2010 (8th anniv), $1.99 in 2011, and probably $1.99 in the years before 2010. The 50% off is combined with existing 40%-discounted price = 70% (See later in the thread for how the math works). And then Chohole posted something which showed me boo boos I've now corrected. *sigh* I'm not going to keep noting every edit. Out of the ten products listed, please vote once for the one you’d most like to see on sale. The five products with the most votes will then be put on sale for 50% off! Voting ends on Thursday Oct 4 and we’ll put the items on sale Friday. It’s going to be 50% off the current price so an overall discount of 70% for Platinum Club members. For what it's worth I'm in the exact same boat. I'm a former PC member considering joining again but have been reluctant/hesitant because of all the problems I have heard. Much of that was back when the new store first went live and everything was screwing up though, so I figured much of it might be fixed now and plus the problems seemed more intermittent then universal. So the deal maker/breaker was going to be the membership price. If it was discounted then I'd go ahead but if it wasn't then I wouldn't. In my case though I was able to see the promo and at least at this point they're offering no discount. It looks like they are at first glance because they show the annual membership as $69 in big numbers but in smaller darker text in the graphic it says Plus $30 Activation so it's currently $99 which is full price. I guess they're not interested in getting new members because as it currently is there is no additional incentive (compared to any time other then the PC Anniversary) for new people to join. I mean sure once you join there are deals and in general it's a nice promo as it usually is but in a failing economy it's alot to ask people to pay almost $100 for a year or almost $30 for a month first before they can access the other deals. I dunno maybe Daz thinks most people have hundreds of dollars to blow on non essentials just a few months before the big holiday season? They don't of course, well except the top 2% of the country, but hey, why let a silly thing like reality get in the way? So no voting for 1.99 items this year? I'm very disappointed. And what a small list to choose from....last year's list had about a hundred items to choose from, with more added each week to replace those that won. If this is all there is, count me out. I'll spend my money on other things (like a Droid X). So no voting for 1.99 items this year? I'm very disappointed. I'm dissapointed, too. That was the best sale of the year, for me. Already have the coupon degrade, now this is still less value for my membership. (The coupon bit is not their fault, and they hope to restore it, someday s..., if I recall. But from the customer POV, it is still a big dent in the value). The remaining perks are probably enough to keep me, but I've got some weighing to do, before I renew. And what a small list to choose from....last year's list had about a hundred items to choose from, with more added each week to replace those that won. I don't blame you. I wouldn't join for that. I may pick up something in the next 3 votes, if they come up with anything I care about. No-Genesis PC Members will be pleased to see a number non-Genesis items, but displeased that they can't get the whole mess for $79.60. (In real life, they'd skip what they have or don't want, but that'd be the max a person could get). *Shakes the calculator* Dang it! No matter what I do I cannot seem to get 50% and 30% to add up to 70%! I quoted from a post by DAZ_Ryan. I guess he maybe got muddled and said 30% which is normal PC discount, but at the moment DO's are 40% discount. Hi MJ, I just processed an order...it wouldn't allow me to put two coupons against the order. so I used the standard pc monthly coupon. I'm assuming I can use the $4 one on another order. I'm unsure whether the $10 coupon is valid yet as it's in the things to come column. Can anyone verify if it's useable yet and if so is it a once off item? Because of the wording of the message, many people may not understand the true nature of the discount. The notice makes it look like the discount is 50% off the regular prices. Someone may want to edit that. Is this it?!?!?!?! As said the list of votable items is typically *MUCH* longer! Wow. And of these 10, how many makes the PC discounted rate? maybe the new store software can't do fixed price sales? as opposed to percents. man, i feel like an old veteran. A couple of points for those looking at the members Choice voting this year. 1. Of the ten items listed 5 will go on sale for 50% off. I assume that (and I thought I read it somewhere but I can't find it now - maybe I imagined it) that a new list will appear next week, 50% off is not as good as $1.99 but I guess we'll have to see. Huh, I don't see that stated either, but I didn't look very hard. That would be a hell of a note if it was one week, wouldn't it? I'm sure it'll still be a-vote-per-week, like it has been. Whoa, good point, I hadn't thought of that... I'm trying to remember if I've seen a fixed sale price since the move... kinda think... I dunno. Heh, you are from my POV. I'm there, already. It's all old hat to me now. "Oh... hey... another sale... uh... woohoo?" (I still buy stuff, I just wore out the omigod factor). In years past. myself, and a few select others formed The Animals & Monsters Consortium (AMC) and we rounded up votes and basically competed with the other factions jockeying for placement in the top spots: "New Stuff", "M4 Stuff", "V4 Stuff", "A3 Stuff", etc. to ensure we got certain things we wanted every week. But thats when the list of potentials were like 50 items (roughly) long, and the top 9 (i think) items made the cut. It was ALOT of hard work, and politicing, and negotiating, but it was very entertaining with all the renders and pleas to encourage votes for "their platform". I just checked the thread on a fellow pc member account and its... "Ho hum". Now with only 10 items to vote on... and nothing really note worthy, and then the prices only gets dropped another 50% and not to PC prices... it just aint that fun = not worth it. So im GLADLY sitting on the sidelines with you guys this year. "The ole' Daz forums she AINT what she use to be... AINT what she use to be... AINT what she use to be". 2010 was a blast (The top 10 won, that year. Ties for 10th place would be decided by a mod, or someone). People who had an item would post their appealing renders, and/or extoll the virtues of it. Those who didn't have it would post promos or links. The list was so huge, that people would post updates on the vote, with the current top 10 and runners up. Items that slipped below 10 would see a desperate burst of lobbying. Everybody was making their case. I even got into it, a little, as a newb. I got DS3A for $1.88! When too many people missed week 1, they put it in week 3, too! (It won again). 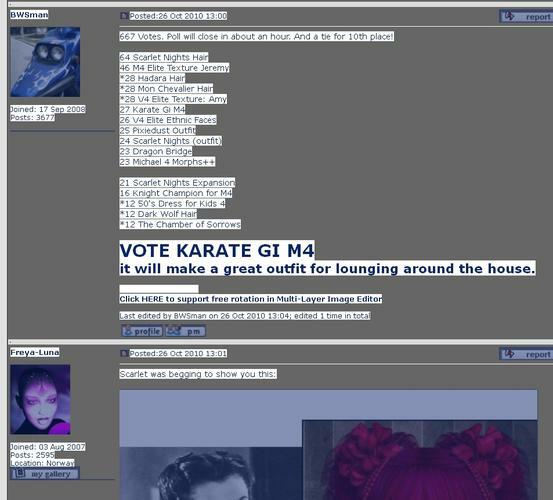 I think they reduced the nominees, or winners, or something in 2011, I don't find a saved page, though. I'm not going to count them all, but here's a list of what you could vote for in week 4 in 2010. (I happened to save some pages). (Sorry, saved pages display weirdly for me - I had to highlight to make text readable). I got the same message. Also, I don't see the PC prices any more & haven't gotten my October PC coupon code. I don't get it. Sept.1, I got an email informing me that as a "Welcome Back" promotion, I was getting PC club membership free through December & the email. I can only guess that the membership was mistakenly done through 9/30, not 12/31. Yes, I'm heading over to open a ticket. It must be able to... ? Could DAZ really have elected to switch to a commerce platform that can't handle that?! Even if it's just a manual process, surely they could use the PC functionality to temporarily change prices for PC members? @Alisa Uh-Lisa: Oh yeah. I didn't think of that. But there's no mention of any more rounds of Members Choice (that I have found). For this year’s Platinum Club Anniversary we’re giving you the opportunity to decide what you want on sale! Out of the ten products listed, please vote once for the one you’d most like to see on sale. The five products with the most votes will then be put on sale for 1.99!